The new library and learning center at Byoona Amagara will become the nerve center of our education initiatives. 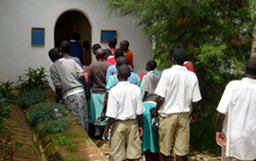 At present, none of the lake area's secondary schools or communities maintain an operational library. The Lake Bunyonyi Secondary School often keeps their library and its resources locked tight simply for lack of a librarian. When complete, the 3-room learning center will contain a reading room with stacks of teaching and learning texts, as well as classical, western, African, children's and local literature, periodicals and plenty of additional general reading material. (We already have over 500 donated books awaiting shelf-space in the library with another 250 on the way.) The library will also house multi-media resources for computer training and networking using the Internet. As a functional telecenter, the schools and community would begin to realize the benefits of various information and communication technologies (ICT). The library will have an exhibition hall for student projects and local history and cultural displays, and which can serve as a combined classroom/seminar room for various purposes, as well as a screening room for viewing educational films and videos.